As 2016 draws to close, here is the sum total of our analysis of the U.S. stock market for the year: It was ordinary. Volatility. Since 1980, the average peak-to-trough intra-year decline has been 14.2%, according to J.P. Morgan Asset Management. Figure 1 below plots intra-year declines along with the total return for each year. To put the early 2016 “Armageddon” in perspective: Measured from the then previous all-time top of 2,130.82 (May 21, 2015), the 2016 low of 1,829.08 (February 11) represented a decline of…14.2%. Returns. Through the end of November, the year-to-date total return of the S&P 500 was 9.8%. An investor who bought and held the S&P 500 for the 20 years ending December 31, 2015 would have enjoyed an average annual total return of 8.2%. Over the last half century (1966-2015), the index’s average return was 9.7% per year. 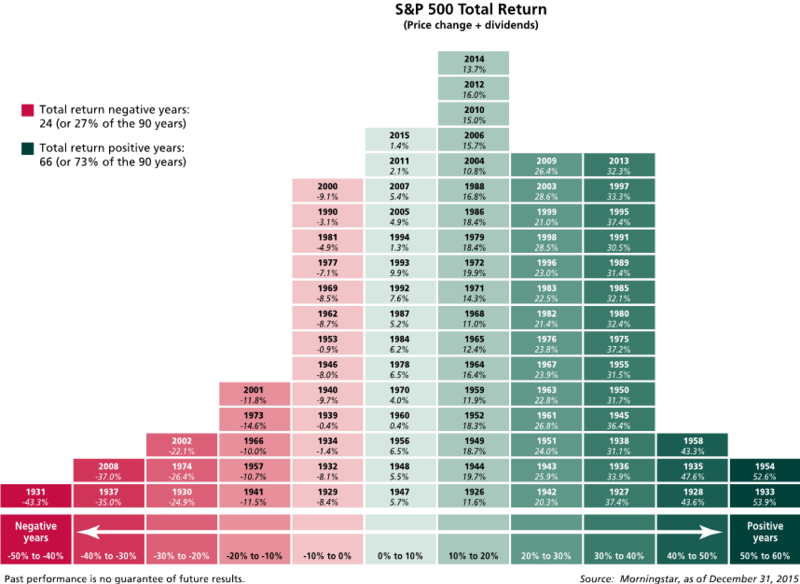 For longer-term perspective, over the 90-year period from 1926 to 2015, there were 15 years where the total return of the S&P 500 was between 0% and 10% and another 18 years where the return was between 10% and 20%. Figure 2 below shows the distribution of these annual returns. Equities are more volatile than bonds, and the bumpy ride is the reason for the higher returns. But equity volatility is not a true risk. Volatility is merely a short-term disturbance, whereas the long-term returns from equities are enduring. Equities are a good investment because they go down temporarily and up permanently. History shows that investors who ignore the short-term ups and downs of the market inevitably enjoy solid returns. That’s because over the long term—decades as opposed to years—the market expands more than it contracts. Surprisingly, the biggest gains tend to occur on just a few days out of the year. 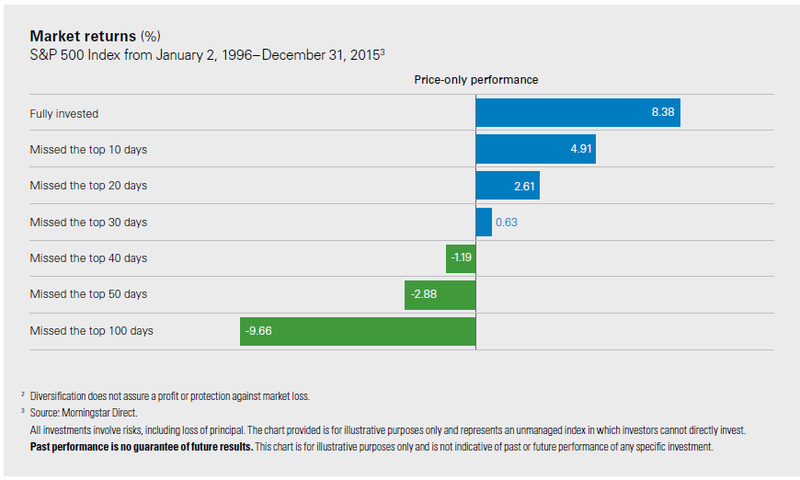 Figure 3 below, from Legg Mason, shows how annual returns would have been affected by being out the market during varying numbers of the top days over the last 20 years. So what did you do in the first two weeks of January when the market was tanking, before and after Brexit, and before and after the presidential election? Did you sell some or all of your equities and move to the “safety” of cash? If so, how has that worked out? When did you, or will you, get back in the market? Equities have not only produced attractive returns over a long period of time; they have produced positive returns the great majority of the time—over 70% of the last 90 years (measured on a total return basis). If there’s a lesson to be drawn from this, it’s that the most effective antidote to volatility has simply been the passage of time. The S&P 500 has gained 285% (total return) from its March 9, 2009 bear market low through the end of November. This ongoing bull market is in its 93rd month. Only the 1990-2000 bull market that was into its 114th month before it peaked on March 24, 2000 has lasted longer among the 11 bulls that have occurred in the last 70 years. 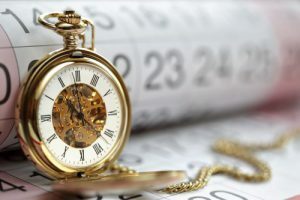 Because bear markets (characterized by a decline of at least 20%) have historically occurred once every five to six years, we’re statistically overdue for one. But no one knows when the next bear will appear. So, as an investor in equities, you’d be well-advised to take J.P. Morgan’s slogan from their current advertising campaign to heart: Think in decades, not days. It’s the best investment advice for today, tomorrow, next year, and the next bear market. Dante’s Divine Comedy helpfully ranks a list of the seven deadly sins, placing pride in worst place. Because the field of behavioral finance is relatively young and still developing, we don’t yet have a definitive list from the academy of our worst cognitive biases as humans. But it’s safe to say that myopic loss aversion—the tendency to become more loss averse the more frequently we evaluate our portfolios—would be on any list of the seven deadly cognitive biases. An investor who is willing to evaluate the outcome of an investment in equities over decades rather than days will always find the asset class highly attractive. The converse is equally true.